Ian Rankin and the Orion Publishing Group today announced plans to mark the thirtieth anniversary of John Rebus, one of crime fiction’s greatest and best-loved creations, with a festival of literature, music, art and film in Rankin and Rebus’s hometown of Edinburgh. RebusFest will reflect the many facets of the irascible old rogue – a fun-filled, entertaining and revealing weekend is guaranteed. RebusFest will take place over the weekend of June 30 to July 2, 2017 and will provide fans and new readers with a wonderful opportunity to explore Rebus’ world and discover the making of an iconic character. The festival, curated by Ian Rankin, will include interactive events, live music, walking tours, screenings, and food and drink, as well as talks on the historic and contemporary influences on Rebus. Experts, artists and performers will join Ian across the weekend to provide a unique insight into one of the most significant and best-loved characters in crime fiction. The full festival line-up will be announced on March 17th, when tickets will go on sale. 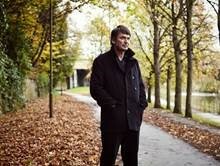 For further updates and exclusive announcements, fans can visit www.ianrankin.net. 2017 is the year of Rebus & Rankin, celebrating thirty years from Rebus’ first outing in Knots & Crosses and most recently in the bestselling Rather Be the Devil. Over the course of the year Ian Rankin will be embarking on an international tour taking in countries across Europe, North America, the Antipodes and South East Asia. The announcement of RebusFest follows the recent news that Ian Rankin is to be made a Fellow of the Royal Society of Literature in recognition of his contribution to contemporary fiction. Rankin’s iconic crime novels have gained global acclaim and made him an international bestseller.